I stepped out of home and it began to pour, not a gentle drizzle but furious downpour. I was loving it. Began walking further and then landed at the neighborhood vegetable store- Kovai Pazhamudir Nilayam. My eyes are always roaming around, observing people and all that is happening around me. I noticed a couple taking shelter near the fruit juice stall from the rain [am sure they were riding a bike and so were going to wait till rain let up], there was another elderly lady struggling with bags when a driver rushed to her side and took the bags and came back with an umbrella. Amidst all this is when I spotted the "momo" stall. There was a north eastern looking guy plop on the stool and put his head down like he was tired. Before stepping into the store to buy veggies, I walked over to him and asked if he had momos. He answered in the affirmative after asking if I wanted veg or non veg. I told him "veg" and then he asked me to go get a coupon from inside. He had a box of 7 veg momos packed and ready with 2 packets of red sauce by the time I came back with the ticket. Asked him if he could hold on to the box while I went shopping, but he obviously dint understand for he handed the bag and smiled a big one and plopped back on his stool. What a perfect snack for this kind of a rainy evening. 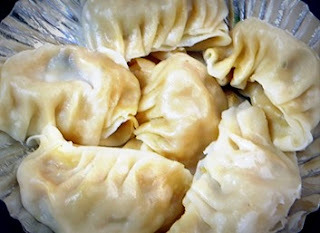 I do make momos at home, but once in a while it is nice to just pick something up and dig into.. Location: Outside any Kovai Pazhamudir nilayam am guessing- this was on Harrington Road..